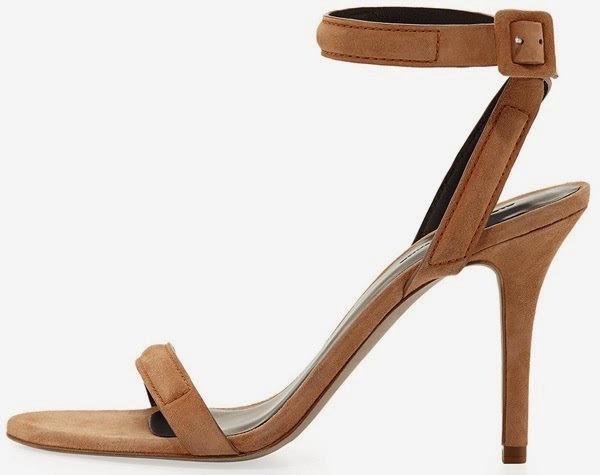 Glowy: Kim Kardashian In Alexander Wang Antonia Beige Suede Sandals. Kim Kardashian In Alexander Wang Antonia Beige Suede Sandals. She wore a Givenchy Fall 2014 jacket on a Wolford Fatal Dress and then paired up with a Alexander Wang Antonia Beige Suede Sandals which features a beige suede leather with open toe, crisscross ankle strap with self-covered buckle,and a 3.5(90 mm) inch heel height. We've seen her on this shoe before here. This is one smashing look we've seen of her..and the sandals is simple and beautiful.. Jacket: sold out at Net-a-porter. Kim my lady.......the sandals are lovely.